Sometimes individuals work on their Family History daily and others not so much. Regardless of where one falls in that area remembering where one left off can be challenging with the added activities of daily life. 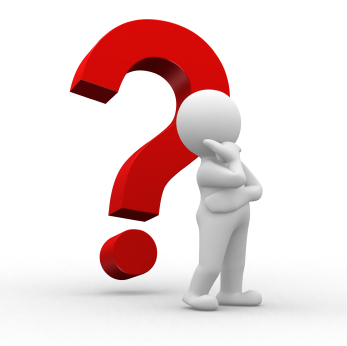 One would open up a family file and unless it is set to open on the last person being researched, it will open to the person it is set to open on each time. Even if the program is set to open on the last person research was being conducted, the chances of remembering exactly what was done can be slim. 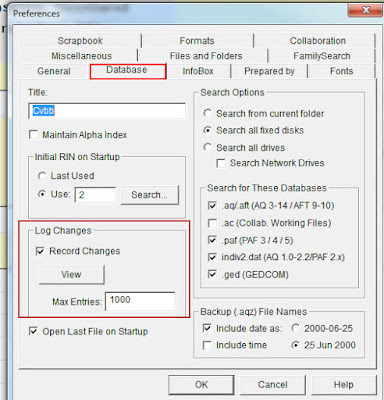 Once you click the box next to "Record Changes" the changes to the database are being recorded in a flat text file with enough information to help you get back on track. 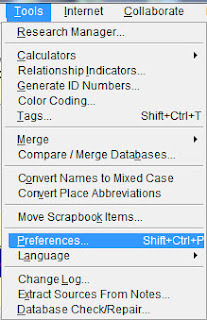 At this point you can scroll through to the last one, you can also print the file, the choice is yours. 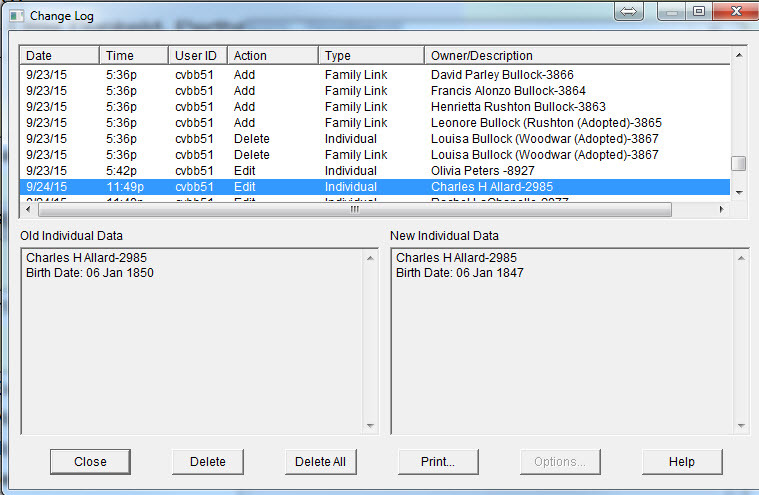 Note that it shows you both the old data and the new/updated data or changed data. Either way it will help you as you continue to research your family lines. Planning ahead is always a good thing. 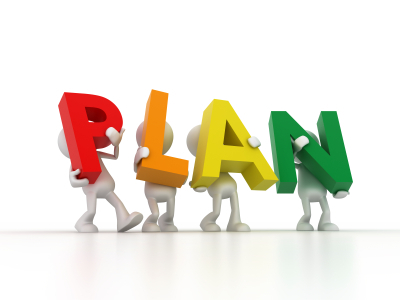 If you plan and follow through you can usually prevent most major problems. 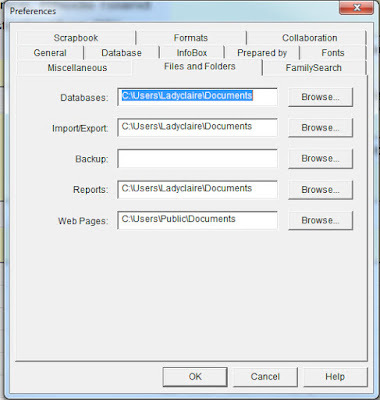 Ancestral Quest allows you to designate where your files are stored. While there are default locations, you can choose to accept them or change them. 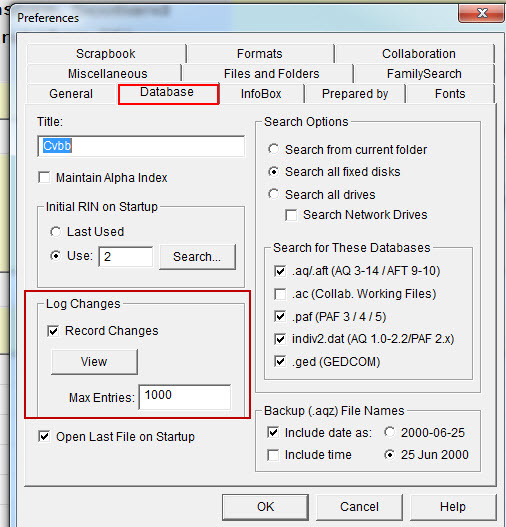 At this point you are able to choose the locations for Databases, Import/Export, Backup, Reports and Web Pages. 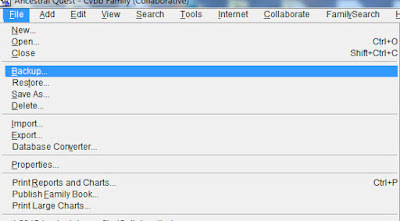 By clicking on the Browse button you can choose your specific location. 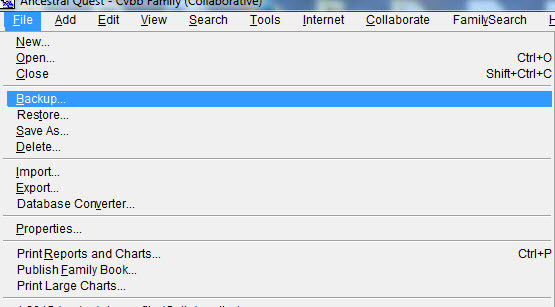 Once you are done, click "OK" and you are brought back to your main family file data. Adding the locate for your backup will help you know where they are always located. 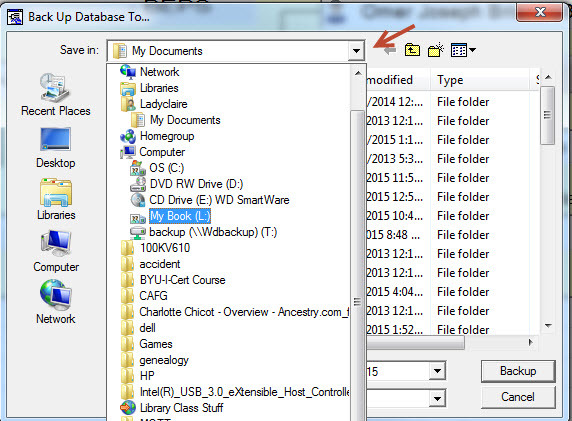 It is suggested that this be an additional device, either an external drive or a USB drive. Enjoy the peace of mind knowing where all your files are saved to when working with Ancestral Quest. 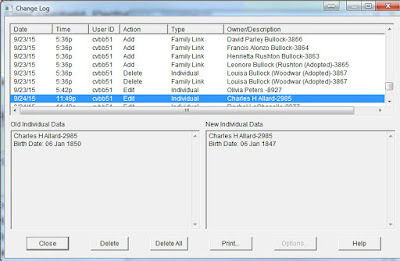 Each day individuals spend a major amount of time working on the Family History and/or Genealogy, some perhaps as often as time will allow. At the end of the day Ancestral Quest is closed down and it is often assumed that all will be there tomorrow or the next time you open that particular program. Unfortunately it isn't always so. 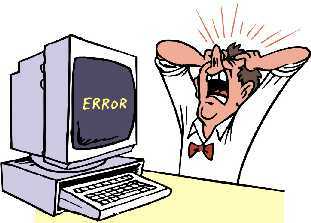 Individuals around the world have turned on their computers only to find that there has been a hard disk failure. This is a scary situation as we rely on computers as a storage place of valuable data including our ancestral families, photos and documents. To add to this dilema, the multiple digital devices used on a daily basis to store pictures of family and friends at different gatherings, perhaps photos of tombstones from visiting the cemetery and a host of other media is stored on a large variety devices. Without a schedule or a regular habit, years of research can be gone in moment. At this point you'll have to decide where to save it to. It is advisable to store backups on an external drive and/or a USB Flash Drive, this way you'll be able to have your data, etc. 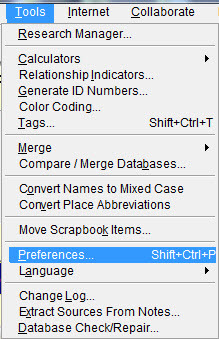 This completes your backup of your family file data. If you have multiple family files, it is suggested you do this to each of them. 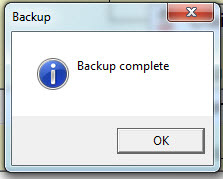 It is recommended to do a backup each time you finish using the program. If you do a backup once a week and have to resort to going back to that particular date, then all you have done since then would be lost if you had problem with your computer. 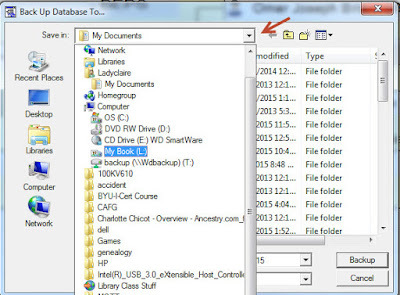 This simple backup can save your years of research!